Definition at line 1081 of file llimage.cpp. Referenced by find_file(), and get_codec(). Definition at line 1519 of file llimage.cpp. Definition at line 1512 of file llimage.cpp. Definition at line 1504 of file llimage.cpp. Definition at line 1083 of file llimage.cpp. References exten, file_extensions, i, llifstream, and NUM_FILE_EXTENSIONS. 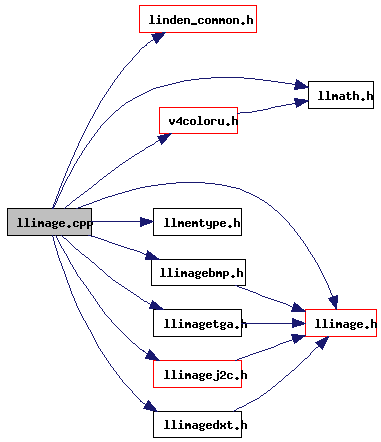 Definition at line 1101 of file llimage.cpp. References codec, exten, file_extensions, i, IMG_CODEC_INVALID, and NUM_FILE_EXTENSIONS. Referenced by LLImageFormatted::createFromExtension(), and LLImageRaw::createFromFile(). Definition at line 1066 of file llimage.cpp. Referenced by LLImageFormatted::createFromExtension(), LLImageRaw::createFromFile(), LLFloaterColorPicker::createUI(), get_codec(), LLFloaterColorPicker::handleMouseUp(), idle_startup(), LLFloaterImagePreview::loadImage(), and LLViewerImageList::receiveImageHeader(). Definition at line 1065 of file llimage.cpp. Referenced by LLImageFormatted::createFromExtension(), LLImageRaw::createFromFile(), find_file(), and get_codec().